This week, Mercaris introduces Ceres, the first in a set of analytical tools for IP agriculture. Ceres will allow users to compare prices for organic cereals against prices for their conventional counterparts. Ceres pulls biweekly prices for organic corn, soybeans, oats, and Soft Red Winter Wheat published by the Agricultural Marketing Service (AMS) and presents them alongside corresponding futures prices for conventional grain published by the Chicago Mercantile Exchange (CME). You can access Ceres here. Users will need to create a log-in (free of charge) in order to use the tool, but once registered, you will be able to view the data in graph and table form, as well as download it into Excel for your own analysis. What Can Ceres Tell Us about Premiums for Organic Grains? A commonly held belief is that organic grains trade at twice the price of conventional. While a 2-to-1 price ratio is sometimes true, it is far from the rule. By using Ceres to compare organic and conventional prices, we see that the ratio between the two types of crops is not stable or consistent for any of the four major grains covered. For example, during the April 2008 to January 2013 period, the organic/conventional price ratio for corn bounced from a high of 3.17 to a low of 0.96, with a median price ratio of 1.83. Over the same period, the organic/conventional ratio for soybeans peaked at 2.74 and bottomed out at 1.21, with a median of 1.77. 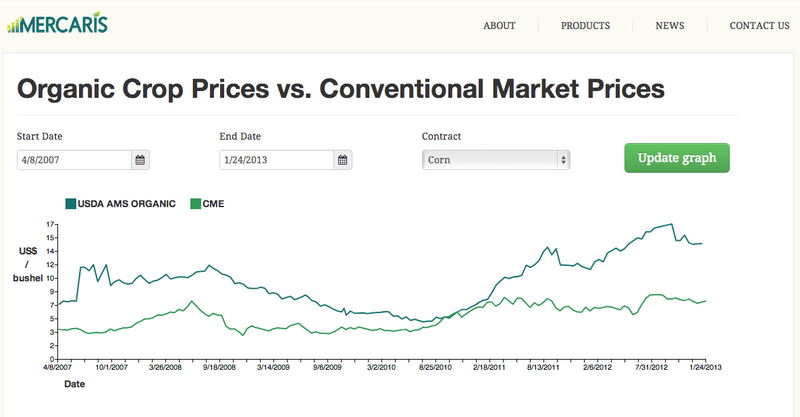 The graphs available with each Ceres search make the lack of a clear price relationship particularly visible. As seen in the corn prices plotted in Figure 1, the distances between observed organic and conventional prices widen and narrow with little adherence to a predictable price relationship. At one point (in November 2010), the price line for organic corn drops below the conventional price line, resulting in a price ratio of 0.96 and a short-lived negative organic premium. Similar volatility in the relationship between organic and conventional prices is observed in soybeans, SRW Wheat, and oats. Ceres uses price data from the U.S. Department of Agriculture’s Agricultural Marketing Service and the Chicago Mercantile Exchange. Ceres displays the weighted-average cash price for the organic crop alongside the futures price for the nearest expiring contract. For example, the AMS organic feed corn price for the two-week period ending January 12, 2013 of $14.09/bu is plotted against the January 11, 2013 settlement price for the corn futures contract expiring in March 2013 ($7.09/bu). Since the final settlement price of an expiring futures contract should reflect the spot market, Ceres comes close to comparing cash organic prices to cash conventional prices, particularly in the weeks nearest to contract expiration. By using the closest expiring contract, price differentials attributed to cost-of-carry (e.g., storage) are minimized, although not entirely eliminated. Though the comparison between organic cash prices and conventional futures prices may not be a perfect one, CME is a widely referenced price for participants in grain markets, and like the AMS organic price is a national rather than regional price. In assessing our own data results, we benefitted from some rigorous quantitative analysis on organic price premiums published by economists at Iowa State University (see: Organic Crop Prices, or 2x Conventional Ones?). They compared organic and conventional cash prices for corn and soybeans in several U.S. markets from October 2004-July 2009. Their findings support and explain the lack of a long-term price relationship between organic and conventional grains. The results of the Iowa State study may be of little surprise to regular industry participants. Instead of supporting a long-term 2-to-1 price ratio between organic and conventional, the data suggested significant volatility in premiums paid for organic grains. In addition, the data revealed jump-like behavior for organic grain prices, meaning that organic prices held steady for many weeks and then jumped to a different level (higher or lower) on a periodic basis, creating a step-like pattern when viewed on a graph. The authors attributed this step-like behavior to the thinness (i.e., the low number of transparent transactions) of organic markets. When buyers and sellers lack regular and reliable price information, they tend to behave cautiously, relying heavily on forward contracts and clustering around common price points. The study also found that average organic/conventional price ratios were greater than 2 during the 2004-2009 time period. Thus, organic price premiums averaged more than double the conventional price, though these premiums varied widely, with organic/conventional price ratios for corn ranging from 1.13 to 4.23. Given the lack of a predictable price relationship between organic and conventional grains, organic growers (and buyers) have limited ability to use price signals from conventional markets for their own businesses. Many participants manage price risk through forward contracting, but those strategies may be inadequate without regular market updates on prices as well as other factors affecting supply and demand. In response, Mercaris is developing additional data tools for the industry. Next on our agenda is enhancing the availability of cash market price data for organic and non-GMO grains. We have enjoyed getting to know (and learning from) many you in the IP grain industry through our outreach efforts. If you haven’t heard from us yet and would like to participate, please contact me at [email protected]. In weeks when AMS published organic prices from both their Iowa and Illinois offices (no longer the case because data collection was consolidated in the Iowa office in 2012), Ceres averages the two organic prices and compares the average to the CME price. Our revamped website has a new design and new tools, so check it out and tell us what you think! Also on our website: upcoming product launches, archived newsletters, career opportunities, and our new Ceres price comparison tool!